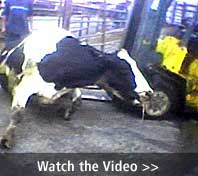 The Humane Society has a remarkable video of workers using a forklift to get "downer" cattle up on their feet long enough to pass inspection. Beyond the cruelty evident in the video, the Washington Post explains that putting downer cattle into the food supply is dangerous. One reason that regulations call for keeping downers -- cows that cannot stand up -- out of the food supply is that they may harbor bovine spongiform encephalopathy, or mad cow disease. It is caused by a virus-like infectious particle that can cause a fatal brain disease in people. Another is because such animals have, in many cases, been wallowing in feces, posing added risks of E. coli and salmonella contamination. The Humane Society and other groups have for years urged Congress to pass legislation that would tighten oversight at slaughterhouses. The coverage at Ethicurean doesn't think much of Schafer's complaint that the Humane Society should have come directly to USDA with this information. The USDA had ample opportunities to discover what was going on. An inspector visited the Westland plant twice a day at the same exact time — always a great way to keep tabs on something. Do health inspectors tell restaurants when they’re coming through? The meat industry in this country is broken from start to finish. We take ruminants and feed them grain their stomachs weren’t designed to eat, treating them like garbage disposals for our industrial leftovers; implant steroids so they’ll grow faster; feed them antibiotics so they can survive the poor diets and crowded feedlot conditions; then ship them to slaughterhouses where they are killed and processed at speeds that practically beg for bacterial contamination and worker injuries. What will it take to get Americans to stop eating beef that’s been marinated in E. coli and suffering? At what point will we say enough is enough? My five-year-old daughter has been asking questions about vegetarianism, which I'll tell you about in a future post. Meanwhile, maybe it's time to join the New York Time's Mark Bittman in at least rethinking our meat consumption. Should food stamps be included in the stimulus package? Bob Greenstein from the Center on Budget and Policy Priorities yesterday argued "yes." Changes reportedly made last night in the stimulus package would reduce its effectiveness as stimulus. Although the package includes a reasonably designed tax rebate, the two most targeted and economically effective measures under consideration — a temporary extension of unemployment benefits and a temporary boost in food stamp benefits — were zeroed out, apparently at the insistence of House Republican leaders. ... but then seemed to relent, only partially, after reading interesting responses from his readers. Marty Feldstein may well be right that those on food stamps have a higher-than-average marginal propensity to consume. Nonetheless, I wonder if we really want to target such cyclical measures on the poorest members of society. That is, for any mean level of food stamps, wouldn't the poor be better off with a constant stream of benefits than with a benefit that fluctuates over the business cycle? Using food stamps as a cyclical tool seems to risk destabilizing some families' food consumption in an attempt to stabilize the overall business cycle. Megan McArdle argued that more food stamps aren't needed because poor people are obese, and food insecurity is not [a problem] "except for people who are too screwed up to get food stamps (because they don't have an address)". (Paul Beard from A Crank's Progress sent me the link). TBogg responds to McArdle's post, so I don't have to waste time with it. I'll defer a more thoughtful post about food assistance and risk of overweight and obesity until a later date. But a quick look in the U.S. Food Policy archives offers some useful facts, which might serve to temper this argument. USDA research suggests the gap in risk of overweight between food stamp participants and nonparticipants is shrinking anyway, at least for some demographic categories, because Americans from all walks of life are increasingly becoming overweight. How safe and effective are DHA and ARA additives in infant formula? Infant formula companies say oils that have been added to infant formula in recent years make the products "closer than ever to breastmilk." But these additives -- DHA (an omega-3 fatty acid) and ARA (an omega-6 fatty acid) -- may be ineffective or even unsafe, according to a report released today (.pdf) by the Cornucopia Institute, a Wisconsin-based food policy advocacy group. What is troublesome, however, is that some infant formulas contain DHA- and ARA-containing oils that are novel foods—extracted from laboratory-grown fermented algae and fungus and processed utilizing a toxic chemical, hexane. These algal and fungal oils provide DHA and ARA in forms that are structurally different from those naturally found in human milk. These manufactured oils are known as DHASCO and ARASCO, which stand for docosahexaenoic acid single cell oil and arachidonic acid single cell oil. Scientists have conducted numerous studies that show little or no benefit to an infant’s development from adding DHASCO and ARASCO to infant formula. Overall, research results are inconsistent and inconclusive. Meanwhile, the formula companies have advertised aggressively in an attempt to convince parents that their DHA/ARA formula provides the same nutrients, and therefore the same benefits, as breast milk. Mainstream web sources on DHA and ARA offer little reassurance. The Food and Drug Administration's FAQ page about infant formula says there is mixed evidence of short term benefit and no evidence of long term benefit. FDA says systematic monitoring is not in place to assess risks and benefits in countries where these addititives have been used, and the agency has asked formula makers to do postmarket surveillance of infants who consume these additives. The Canadian Broadcasting Corporation this week offered a fascinating feature on food rating systems. Yoni Freedhoff from the Weighty Matters blog takes the interviewer on a tour through the grocery store and comes down hard on Canada's Health Check symbol. The CBC compares the Health Check symbol unfavorably to the "Guiding Star" system introduced last year by the Hannaford supermarket chain. And David Katz defends the Overall Nutrition Quality Index (ONQI) system he and his colleagues have proposed. As for the concern raised about the system being proprietary: the ONQI was developed with no commercial interest in view. It was supported by the non-profit Griffin Hospital, in Derby, CT- and when finished, offered first to the US FDA. The FDA, while very supportive of the work and the sophistication of the ONQI, encouraged commercialization as the only way to get the ONQI into consumer hands any time soon. So now, yes, there are business interests involved. And there is intellectual property. But the fundamental workings of the ONQI algorithm were shared with scientists at a conference held in Washington, DC on 11/30/07 devoted to the purpose of transparency. Dr. Nestle was invited, but unable to attend. The ONQI will soon be published in the peer-reviewed literature as well. Not every last detail of the algorithm will be shared, but more than enough for those even with somewhat less expertise than Dr. Nestle to judge the reliability and robustness of the system. Of the 100 or so scientists who attended the November conference, not a one complained that they had insufficient detail to judge the algorithm. I won't trust any food rating system whose full scoring details can't be widely shared with everybody and scrutinized. A conference presentation or partial write-up does not suffice. At first, my wife and I both fell for Juno, the well-received recent movie about a charming off-beat teen's pregnancy. Preparing for a new life while the life in progress bears up under stress is a theme that always plays my strings. The Lauren Hill song "Zion," a single mother's ballad for a new son, made my eyes tear when it came up on my iPod on the walk to the train station this morning. A couple days after our movie date, though, I'm sorry to say that my most memorable mental images from Juno are the bald product placements for Sunny Delight, the unmeritorious sweetened orange drink, and Tic Tacs. The Sunny Delight bottle shows up in a freeze frame hand-drawn image in the opening sequence, which is probably the most craven product placement I've ever seen. The Tic Tacs are ubiquitous. And that in turn puts me in the spirit to link to a damning review of the movie. I'm not a frequent movie goer. But Ken Krimstein, who puts more time into culture watching, judges that Juno is derivative and mercenary from top to bottom. Cheap food at all costs? The BBC World Service radio talk show World Have Your Say had an interesting programme today about tradeoffs between food costs and other nutrition and environmental goals. After reading an earlier post on U.S. Food Policy, they called to ask whether I thought it was essential to seek cheap food at all costs. They were juggling a bunch of other interesting interviews with callers from places like Nigeria, Kenya, and India, with a lot of insight into hard food choices in less developed countries. My own hunch is that the tradeoff between healthy food and cheap food for hungry people is overdrawn. Several factors can make food too expensive: more packaging, more processing, air freight, placement high on the food chain (animal products), rare or exotic sourcing (caviar), and nutrition and environmental quality (organic, local boutique farming). Most of those factors suggest healthy wholesome food and low cost can be complementary. Even when these goals are competitive to an extent, as in organic food, the tradeoffs probably don't break the budget. It would be folly to pursue cheap food at all costs. Project Bread and the MA Department of Education for several years have collaborated on the Child Nutrition Outreach Program. The partnership works to enhance child nutrition programs, especially the School Breakfast Program and the Summer Food Service Program. For many children, the School Breakfast and Summer Food Service Programs provide critical meals that they might otherwise go without. Both programs adhere to nutrition guidelines set forth by the United States Department of Agriculture (USDA). Yet, because these guidelines are so broad, Project Bread has developed additional guidelines that are above and beyond those set by the USDA. We have also worked to create access to the freshest produce available by encouraging food service directors and summer meal providers to purchase locally grown vegetables and fruits. ... and a Locally Grown Foods Project. The Locally Grown Foods Project is a collaborative effort between Project Bread and the Massachusetts Farm to School Project. Through this partnership, summer meal providers connect with local farmers to purchase fresh, locally grown produce for summer meals. As a result, children who attend participating summer meal sites receive the best quality produce available. Will Perreault and Isha Plynton, who are Bill Emerson National Hunger Fellows with the Congressional Hunger Center, helped put together a voter education guide (.pdf) to the current Presidential Election. The guide sought to be nonpartisan, but the major Republican candidates sat out this conversation about hunger and hardship for low-income Americans. The following candidates were mailed this questionnaire and contacted by phone but did not respond by the announced deadline: Chris Dodd, Rudy Giuliani, Mike Gravel, Mike Huckabee, Duncan Hunter, Alan Keyes, Dennis Kucinich, John McCain, Ron Paul, Mitt Romney, Tom Tancredo and Fred Thompson. People who are interested in their views on this matter should contact their campaigns directly. In your eyes, what is the single most effective policy measure to enable food insecure individuals to become food secure? What will you do to promote this policy? Hillary Clinton's response to this question highlights economic issues. We need to address the root cause of the food security problem – economic insecurity. I have proposed a new economic blueprint that will put us on a path toward shared prosperity by creating more good jobs, restoring fairness to our economy, & renewing the bargain that if you work hard you can get ahead. Barack Obama's response emphasizes the Food Stamp Program. Our food stamp program targets those who need it the most & expands in times of economic trouble. It also helps its recipients eat more healthily. I will increase funding & protect it from cuts. Most importantly, I will provide the leadership this country needs by speaking about the key role that food stamps play in alleviating hunger. If you were one of these candidates, would your own response have emphasized economic issues or food assistance programs? According to the old saying, there are two things in life whose manufacture you never want to see: laws and sausages. U.S. Food Policy always keeps its eye on the manufacture of laws, but I never witnessed sausages being made until yesterday. At Anne and Josh's sausage making party, in between all the bustle and conversation, we added spices and flavorings to about 50 pounds of local organic pork and lamb, ground it, packed it into pork intestines, cooked some of it in a smoker, vacuum sealed it, and distributed it to all the party-goers. My son stuffed meat into the grinder, while my wife and daughter took photographs. Perhaps mistaking me for one of the many good cooks in the room, Anne put me in charge as recipe manager for a batch of 10 pounds of brandy and sage sausage, with real brandy and fresh sage from her backyard garden. The potluck lunch at the party included home-made bread with either home-made pate or home-made raspberry jam, deviled eggs from one friend's backyard chickens and her own pickled okra. Now, I've finally seen how sausages were made once upon a time. And I no longer understand the old saying. The question -- "Does watching TV make us happy?" -- is one I have been asking for many years. It is also the title of a recent article by Bruno S. Frey, Christine Benescha, and Alois Stutzer in the Journal of Economic Psychology. Individuals are assumed to know best what provides them with utility and are free to choose the amount of TV consumption that suits them best. By revealed preference, it follows from the fact that individuals watch so much TV as has been empirically observed that it provides them with considerable utility. Watching TV is a major human activity. Because of its immediate benefits at negligible immediate marginal costs it is for many people tempting to view TV rather than to pursue more engaging activities. As a consequence, individuals with incomplete control over, and foresight into, their own behavior watch more TV than they consider optimal for themselves and their well-being is lower than what could be achieved. We find that heavy TV viewers, and in particular those with significant opportunity cost of time, report lower life satisfaction. Long TV hours are also linked to higher material aspirations and anxiety. Of course, TV watching also has a strong association with nutrition issues such as childhood overweight and obesity. Some researchers suspect that TV watching is simply correlated with other types of dysfunction, which in turn contribute to overweight and obesity. Other researchers think TV watching contributes directly to weight gain because it displaces active time with sedentary time, provides a venue for continuous snacking, and exposes the viewer to thousands upon thousands of advertisements for junk food. More plausible causal explanations for the observed correlation between television viewing and obesity exist. First, television viewing is a sedentary activity; thus, at least some of the time that children spend watching television might otherwise be spent on more active pursuits.... Second, there seems to be a tendency for both children and adults to snack while watching television, thereby increasing calorie intake. Of course, the snacking may be triggered in part by exposure to food ads; as previously discussed, however, children's ad exposure has been found to have a very small impact on their snacking. Another possible explanation for the link between snacking and TV is that it is simply easier to eat while watching television than while pursuing other activities. If you think about it, does it really matter which of these explanations is correct? Don't they all reflect very badly on TV watching? The Bread for the World Institute, the research arm of the faith-based anti-hunger lobbying group Bread for the World, recently released its Hunger 2008 report, Working Harder for Working Families. It offers a compelling mix of powerful photographs, personal stories, and fine clear data illustrations. It describes food insecurity and hunger without either exaggeration or understatement, and places hunger correctly in the context of poverty and the low-wage labor market. A particular strength is its economically astute focus on how public policy can support work and asset building. These emphases give the report a politically centrist flavor, but it still packs a good hard policy wallop. You may well close the report with a new determination to do something about what you see. More importantly, you may have an improved diagnosis about what that something should be.